22/09/07 — Exhibition — Caen, Musée des Beaux-Arts — After being in Nancy, the Charles Mellin exhibition (see article) is now making its second stop at the Musée des Beaux-Arts de Caen in a more subdued, but no less effective, staging suggesting other rapprochements. Thus, the two Angels from Capodimonte look at each other in a corner of the room enabling the museum goer to see the one attributed to Vouet at the same time as the Young Man in Armor said to be Saint William of Aquitaine (ill. 1), leaving no doubt as to its attribution. The second Angel is next to the Jaël by Mellin, another comparison which again confirms the authorship by the latter (ill. 2). All of the paintings displayed in Nancy were able to make it, except for a few works by other artists used for comparisons. Caravaggio’s Annunciation did not leave Lorraine for obvious reasons. 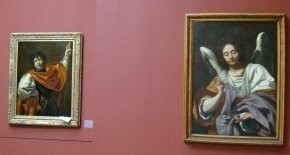 However, there is a beautiful canvas by Massimo Stanzione from the Musée des Beaux-Arts et d’Archéologie de Besançon, recently restored and which illustrates brilliantly, next to the Baptism of Christ by Ribera (Nancy), the Neapolitan environment in which Mellin’s last works were born. 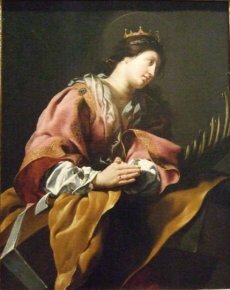 Particularly noticeable is the Saint Catherine of Alexandria from Rennes (ill. 3) which we regretted not seeing in Nancy but which was able to come to Caen. By confronting it with the other Mellin paintings it seems probable that it is by someone from his circle but difficult to attribute to him directly. It undeniably presents many aspects in common with the Annunciation by Nicolas Labbé hanging next to it but not of absolute certainty. The faces of the Virgin and of Saint Catherine are very alike, but the colors are different and the painting from Rennes is of much higher quality. Philippe Malgouyres pointed out to us that the murals in Santa Maria in Aracoeli in Rome (two miracles of Saint Anthony of Padua, published p. 238-239 in the exhibition catalogue) establish, in his opinion, the link between the two paintings. In any case, the question merits further study. All of the drawings here are new. The Young Man Torn between Love of Vice and Love of Virtue (cat. D4 ; Rouen, Bibliothèque Municipale), very awkward, is definitely not by Mellin but, as proposed by Philippe Malgouyres, perhaps by one of the Muti brothers (the sign should say so). 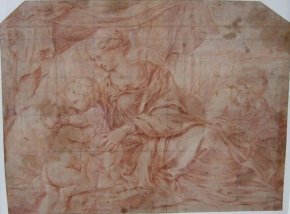 There is also a red chalk drawing (ill. 4) attributed to Mellin. When seen next to the painting for which it is probably a preliminary study (with several important variations, notably in the position of Saint Joseph), its authorship seems certain. Philippe Malgouyres informed us that Eric Schleier had just found another red chalk drawing by Mellin in the same style. Let us hope that this discovery will soon be covered in an article, thus providing leads for further attributions. The reconstitution of Mellin’s work continues to grow.